Here is a guidance from the Nagano station to Kawaichiya. Take a bus for Nozawa onsen at the Nagano station and it takes 75 minutes to Nozawa onsen (Time table). Please get off at the Center Terminal and walk to Kawaichiay. It takes 2 minutes from there. Take a JR Iiyama line for the Togarinozawaonsen station at the Nagano station and get off at the Togarinozawaonsen station. Take a bus for Nozawa onsen at there and get off the last bus stop (Time table). It takes 2 minutes from there to Kawaichiya. Train time table : Check on this site. We have got a lot of questions about the Snow Monkey Park, then I would like to introduce something regarding the Snow Monkey Park separately. Jigokudani Yaenkoen is very famous as the Snow Monkey Park. Since 1964, Jigokudani Yaenkoen loved by many people in all over the world. Jigokudani Yaenkoen as a place where the interesting the mode of life of the Japanese Macaque can be observed nearby, and as a place of Monkey's Onsen. And many researchers and photographers coming too, and they leave their achievements lots. Jigokudani Yaenkoen is located in a mountainous area in approximately the center of Japan. Jigokudani Monkey Park is located in the valley of Yokoyu-River that flowing from Shigakogen area of the northern part of Nagano-Prefecture. At 850 meters in elevation, it is a harsh environment where snow covers the ground for one-third of the year. People call Jigokudani which means the Hell's Valley in Japanese because they could see the spectacle that looks like the hell that steep cliff, spring out boiling water from the surface of the earth. But this place is a paradise for monkeys. Six representatives from among the people at climacteric ages receive the original flame from the Kono family at the Terayu. The flame is kindled by striking metal on flint, and then huge torches are fired up. The fire is brought to the festival site while people sing Dosojin songs. Battles start at around 8:30 in the evening, when people with the role of lighting the fire use the original flame to set the torches alight, and try to attack the pavilion. The role of extinguishing the fires is taken by the people at climacteric ages; those who are 42 years old defend the upper part of the pavilion, while 25 year-olds defend the lower part. Take a bus from Hakuba to the Nagano station, and transfer to the another bus there. The magnificent, tall shrine pavilion of Dosojin is about seven meters high, and from the upper section, the sacred trees protrude another ten or more meters. As for its width, the pavilion is eight square meters at its top beam, while the roof is equivalent to nearly forty tatami mats. Because construction of the shrine is dangerous work, participants have to refrain from drinking alcohol and complete the work in silence. The preparation work continues until late at night on the 14th, and is finished in the morning of the 15th. In the autumn of the year before the festival, five sacred trees are logged from the Dosojin forests, which are jointly owned by villagers. 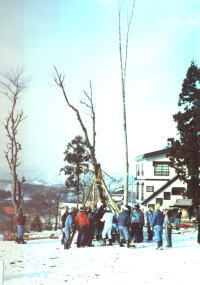 On Januaryu 13th, two groups of people who are at climacteric ages of either 42 or 25 years old take three or more hours to lower two of the five trees down from the Hikage ski-field to the festival site. Families along the route offer sacred Sake, for which the master in charge of each tree shouts his thanks. Clapping their hands in celebration, villagers distribute sacred Sake to passers by. 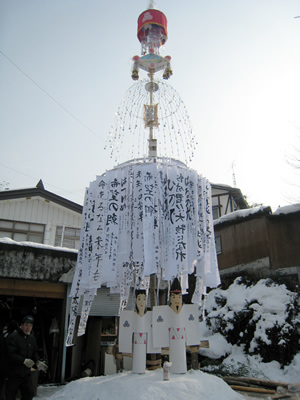 At Nozawa-onsen, when the first boy is born to a couple, the family builds a "first lantern" decoration. Lantern decorations are hung around a nine-meter pillar, of which the upper half is made of cedar and the lower half is a kind of beech wood. Starting from the top and extending toward the bottom are hung, a sacred cloth and an umbrella-shaped cover, from which a cloth with the family's crest is hung. Behind the cloth, under the cover, hang a round lantern with bells, a white folding fan, and a hanging cloth decoration. Next is hung a diamond-shaped lantern decorated with pictures, followed by split bamboo strips covered with paper flowers, which hang off the central pillar to form a bowl shape. Beneath this arrangement are numerous lanterns. At the bottom there are pieces of New Year's calligraphy written by local children and children of rerlatives. On January 11th, a big party called Toro-marume is held. 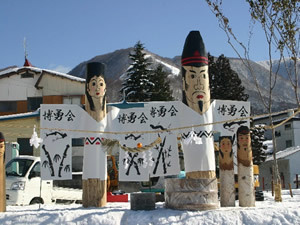 On January 15th, the first lantern decorations are carried to the festival site by a crowd of people singing Dosojin songs and wooden Dosojin statues are made for praying that the first born son will grow up healthy and have a happy marriage. 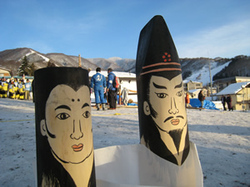 From the evening of January 14th until midday on the 15th, the Dosojin evening festival is held. On the 15th, people visit and pray at the shrine pavilion at the Dosojin site. Preparation for the festival starts in mid-September of the previous year, when firewood is collected and placed in the center of the shrine's pavilion. Sacred trees, materials for beams and rafters, and small sticks for a fire on the top of the pavilion are all logged from the forest, which is jointly owned by the villagers. In late September, the village head and representatives from the village who are at climacteric ages preview the sacred trees. In mid-October, Sanyako group members and villagers who are 25 years old (a climacteric age) participate in logging the sacred trees. Five straight beech trees that are about 30 centimeters in diameter and about 18 meters tall are selected as sacred trees. On the morning of the day when the sacred trees are logged, villagers pray to the mountain gods along the way for the safety of the proceedings. At the beech forests where the sacred trees are located, they hang sacred ropes and cloths, and set up a temporary altar. The tools for logging the sacred trees and beams etc. are arranged on the altar, along with Sake, white rice, and other offerings. 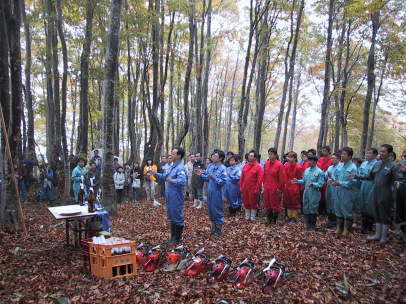 Nozawa-gumi group members, preservation association members, and villagers at climacteric ages gather in front of the temporary altar to pray together and perform self-purification rites. Dosojin -sometimes called Dorokujin or Saenokami- are a folk deity believed to ward off danger near village borders and crossroads. Their stone statues are usually enshrined at village borders. These deities are also worshiipped for bringing fertility and children's growth, and fire festivals dedicated to them are held on January 15th. In particular, Nozawa onsen's Dosojin festival is famous for its spectacular size. We love "Dosojin" Fire Festival. 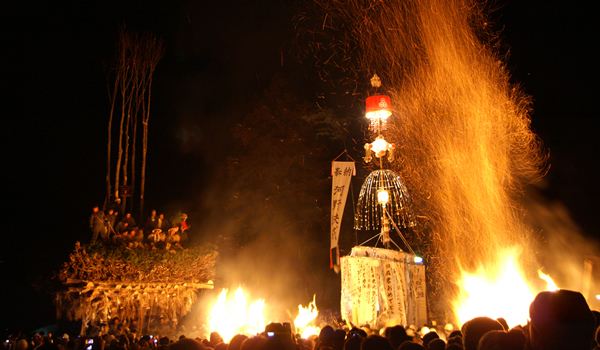 All villagers in Nozawa onsen love the "Dosojin" fire festival. It is held on Jan 15th every year and we get a lot of inquiries for that. We usually are fully booked even before summer season, but we have got some changes for this year's and now we still have some vacancy during that period. If you are interested in this festival, you should come Nozawa onsen to see it. I am telling you, you all are gonna love it! Here is a short introduction. 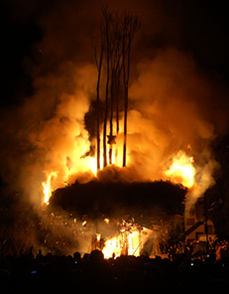 The "Dosojin" Fire Festival is one of the three most famous fire festivals in Japan. It is held on January 15th every year to pray for a plentiful harvest, health and good fortune for the coming year. 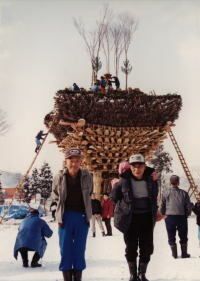 The festival centers around the shaden (shrine), where the fourty-two years old male villagers sit on top and the twenty-five years old stand guard at the base. Torch bearing villagers of all ages attempt to break through the guards and set fire to the shaden. The entire festival can last up to four hours from beginning to end, but the main attraction is the ensuing battle between the guards and the torch bearing villagers. We worried about a lack of snow this snow season, but it's been snowing since a week ago in Nozawa onsen! Finally we have got enough snow to enjoy skiing and snowboarding. We are facing huge financial crisis since last year ... I guess it affects every country very seriously now. I never forget : "After the rain, the sun will shine again."... which is a word my friends sent to me.